Our Safeguard Healthy Family dental insurance dentist in West Hollywood is committed to your dental health. Our boutique-style dental office is fully equipped with the latest in technology, and our skilled dental professionals can offer a wide range of treatment options to diagnose and treat dental diseases. Our Safeguard Healthy Family dental insurance provider in West Hollywood works with each of our patients to identify dental health needs and aesthetic goals. We may recommend taking preventative measures to reduce your risk of future dental health problems or using cosmetic procedures that can enhance every aspect of your smile. Our hours are convenient and designed to fit your schedule, and we regularly offer specials that can help you further explore your options or receive discounted rates on needed services. 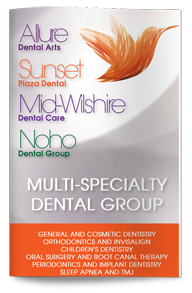 Contact our dental office today to schedule an appointment with our West Hollywood dentist.